Soft pretzels have been on my to-bake list longer than I’m willing to admit. For a long time, I was more than a little intimidated by baking with yeast. I’m happy to say that I’ve gotten past that in recent years. And now that I’ve finally gotten around to baking homemade soft pretzels, I can tell you that they are surprisingly simple to make! The dough for the pretzels comes together quickly, using a short list of ingredients and mixing in about a minute. Thanks to instant yeast, there’s not much rising time, so the start to finish time is quite doable, too. After the dough has rested a short time, it gets rolled and shaped into the classic pretzel twist. 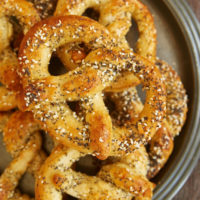 Then each pretzel will spend a few minutes in a mixture of water and baking soda. This step is what gives the pretzels their beautiful color. After that, just add the toppings you want to use, and then it’s oven time! 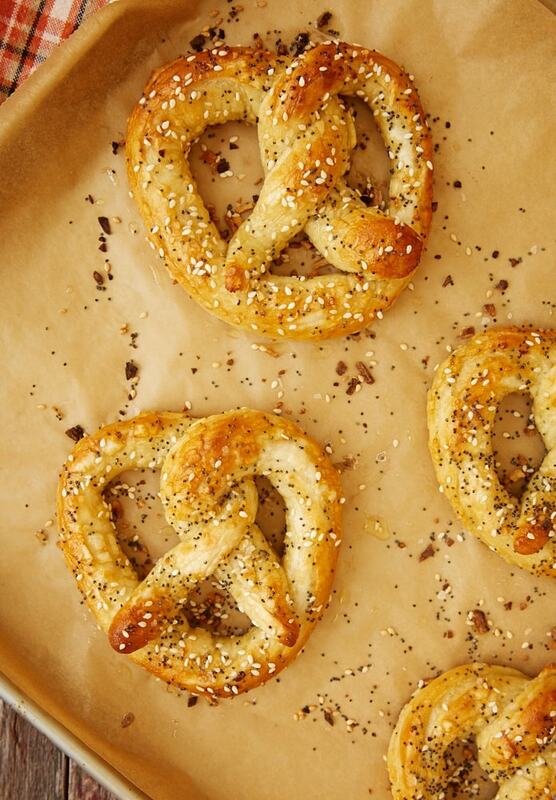 I opted to top these pretzels with King Arthur Flour’s Everything Bagel Topping for lots of extra flavor. 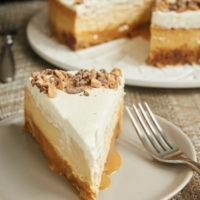 (There are some other brands of that type of topping, too.) 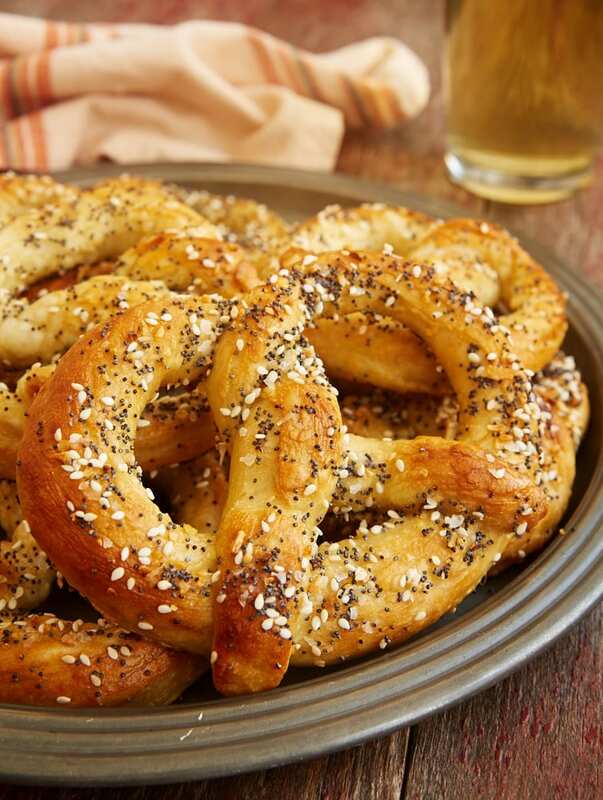 It’s an irresistible combination of salt, poppy seeds, sesame seeds, dried onion, and garlic. You can easily make your own mixture of seasonings or top them simply with a sprinkling of coarse salt such as Kosher salt or sea salt. The best part, though, may be what happens after the pretzels are baked. When they come out of the oven they get brushed with a little melted butter. That buttery goodness is what makes them magical. Any previous hesitations I had about making homemade pretzels is long gone. 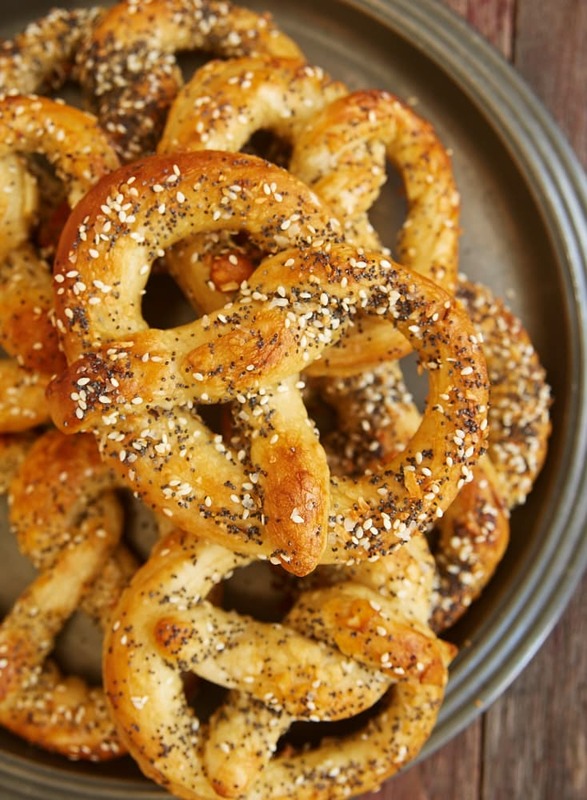 These tasty, buttery, soft, chewy pretzels are easy enough that you can whip them up whenever you have a craving. 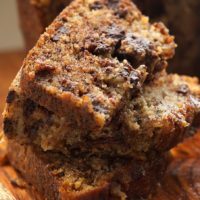 For me, they just might be too easy to make because I have a feeling there are many, many batches of these in my baking future. 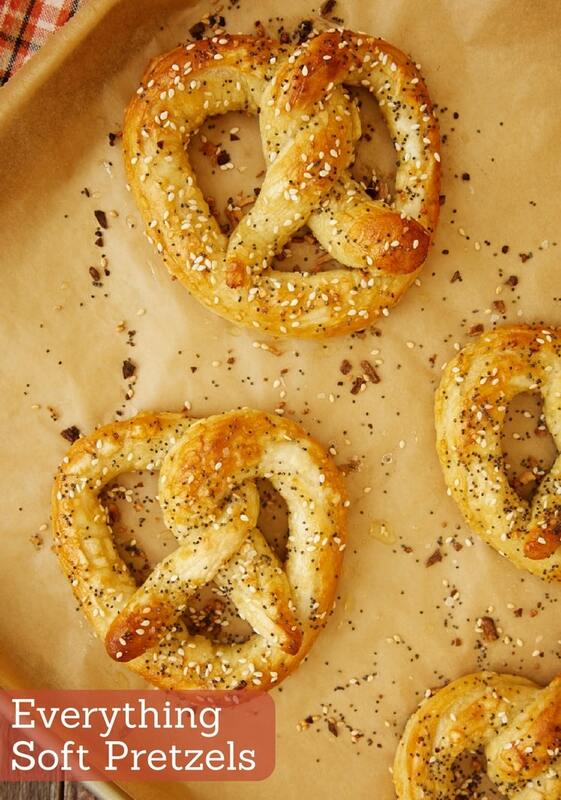 Buttery, chewy, flavorful Everything Soft Pretzels are so amazingly delicious. And they’re surprisingly simple to make! 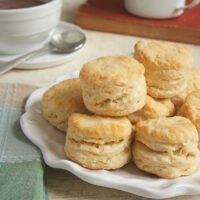 Using an electric mixer on medium-high speed, beat the flour, yeast, sugar, salt, and warm water until well-combined. The dough should be soft and smooth. Flour the dough and place it in a plastic bag. Allow it to rest for 30 minutes. Combine the boiling water and baking soda. Stir until the baking soda is dissolved. Set aside to cool to lukewarm. Cooler is fine, too. Transfer the dough to a lightly floured surface. Divide the dough into 8 equal portions. (Each should weigh about 2 & 1/2 ounces, or 70 grams.) Let the dough rest for 5 minutes. Transfer the cooled water/baking soda mixture to a 9-inch square pan. 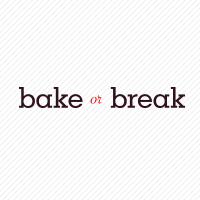 Roll each portion of dough into a long, thin rope about 24″ to 28″ inches long. Then shape each rope into a pretzel. Place the pretzels into the water/baking soda mixture. (You should be able to fit 4 pretzels in the water at a time.) Make sure each pretzel gets covered with the mixture by spooning it over the tops. Leave the pretzels in the water for 2 minutes. Transfer the pretzels to the prepared pan. Sprinkle the topping over the pretzels. Allow them to rest for 10 minutes. Bake 8 or 9 minutes, or until the pretzels are golden brown. Remove the pretzels from the oven. Brush each well with the melted butter. 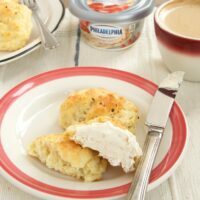 I love the recipe and am encouraged by your admitting to being intimidated by yeast at some point. I just wish I had better success because it seems like the past few times I have attempted to bake with yeast I have not had such success and am now more afraid! I think I must get over this now and try these pretzels, which sound so amazing. 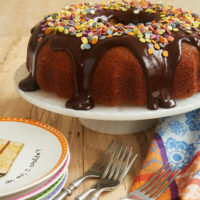 It will be on my to do list and I hope they turn out great as what yours look like! Hi, Carol! I think this is a fairly simple yeast bread recipe. The dough is very easy to handle. Rolling each portion into long ropes takes a bit of time, but it’s not difficult. I hope you’ll give it a try!